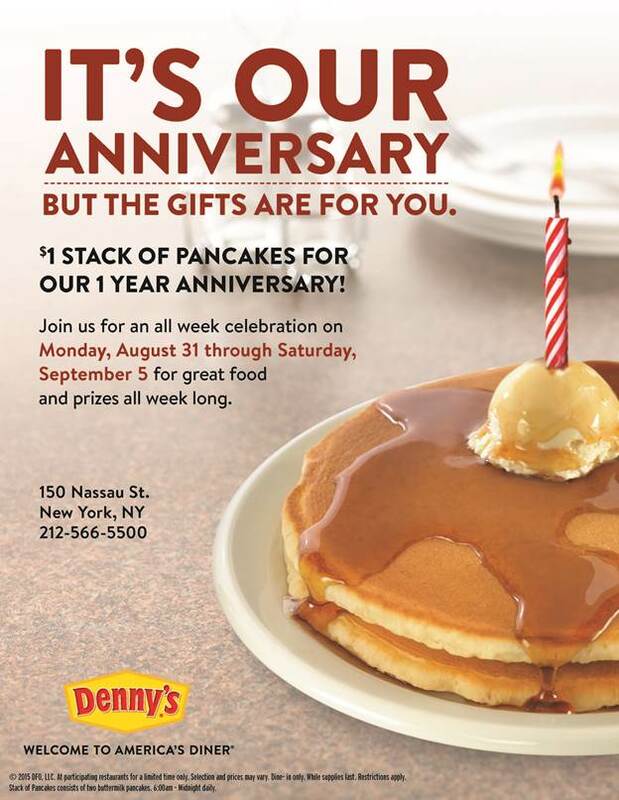 NEW YORK CITY (Aug. 31, 2015) – Denny’s in Manhattan, the diner’s first New York City location, is celebrating its one year anniversary with a Big Apple-style celebration for everyone. 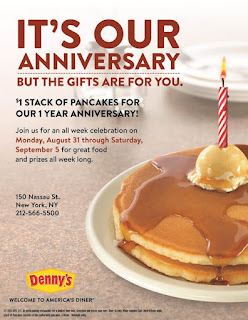 From Monday, Aug. 31 through Saturday, Sept. 5, Denny’s will offer guests a $1 stack of delicious buttermilk pancakes and a chance to win a variety of exclusive prizes throughout the week including branded Denny’s goodies, discounts and free diner favorites. Since opening its doors, Denny’s has attracted guests from far and wide with its unique architecture and locally-inspired design, exclusive menu items such as the $300 Grand Cru Slam®, and a full-service craft cocktail bar – the first of its kind for the brand. Within the rich, dark wood paneled walls, the Manhattan Denny’s has sold nearly 17,500 of its different Slams and poured more than 13,000 cups of coffee in the first year. 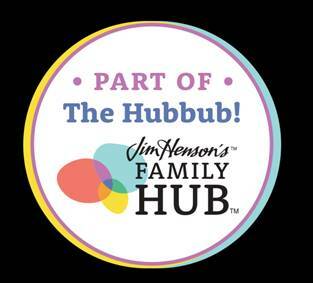 The button-tufted leather booths have welcomed special guests such as actor Mike Meyers, drummer Questlove, professional basketball player and former Brooklyn Nets team member Andrei Kirilenko and actor and former SNL cast member Jason Sudeikis. As a full-service diner, the Manhattan Denny’s is open seven days a week from 6 a.m. until midnight, serving great food at affordable prices for breakfast, lunch and dinner. For more information and a complete listing of Denny’s restaurants, please visit www.dennys.com. Denny's is one of America's largest full-service family restaurant chains, currently operating 1,700 franchised, licensed and company-owned restaurants across the United States, Canada, Chile, Costa Rica, Curaçao, Dominican Republic, El Salvador, Guam, Honduras, Mexico, Puerto Rico and New Zealand. For further information on Denny's, including news releases, please visit the Denny's website at www.dennys.com or the brand’s social channels via Facebook, Twitter, Tumblr, Pinterest, Instagram or YouTube.